As I write this, he is in Alaska with Celine and Australian buddies, looking for steelheads and Pacific salmon! His first love, “real fishing” as he insists, is for coarse fish, and casting a fly is a relatively newly acquired skill, but there is not too much he does not know about how to catch pike, bream, perch, roach and barbel from the Thames at the bottom of his garden (and anywhere else, he can, with ‘celeb’ fishing pals) and his specimens are recorded and photographed and logged on a ‘scoreboard’ in his fishing hut, along with prize catch of each by his son, and also visiting friends. He has more fishing ‘stuff’ than you can wave a stick at in there. Along with a selection of walking and rambling gear, for he, like me, is ‘on a mission’ His, is to walk to the highest point in every county. We have agreed to differ on the number of counties there are! He is a purist! 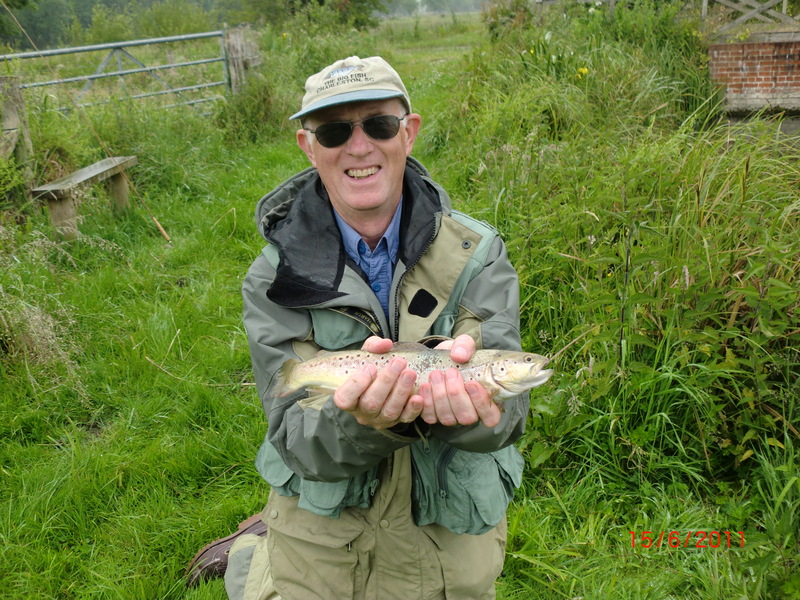 After blanking on the Usk together in April, he reckoned that Round Two with is new dysyllabic (trout!) pal, on his syndicate water would be productive, and so it was to be. 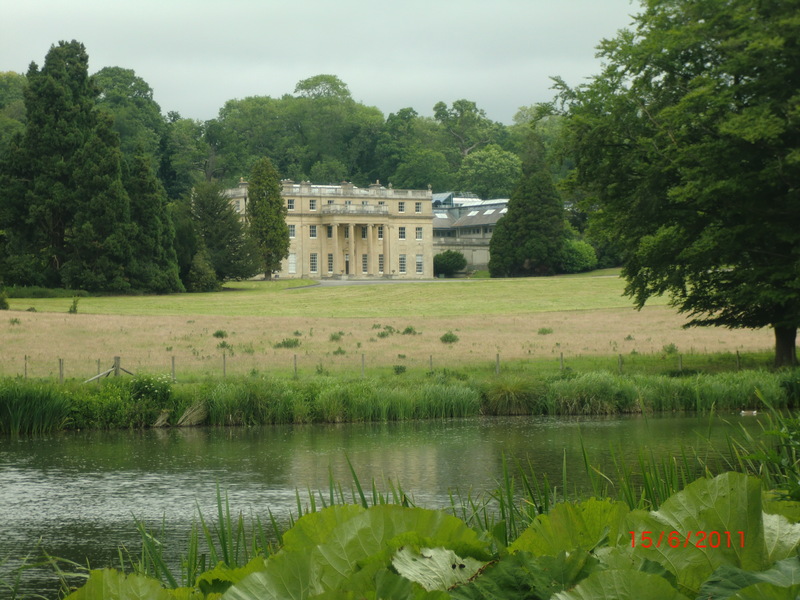 Benham Park is a magnificent mansion designed by Henry Holland and Capability Brown for William, 6th Baron Craven in 1775, and today it has been converted to offices !? 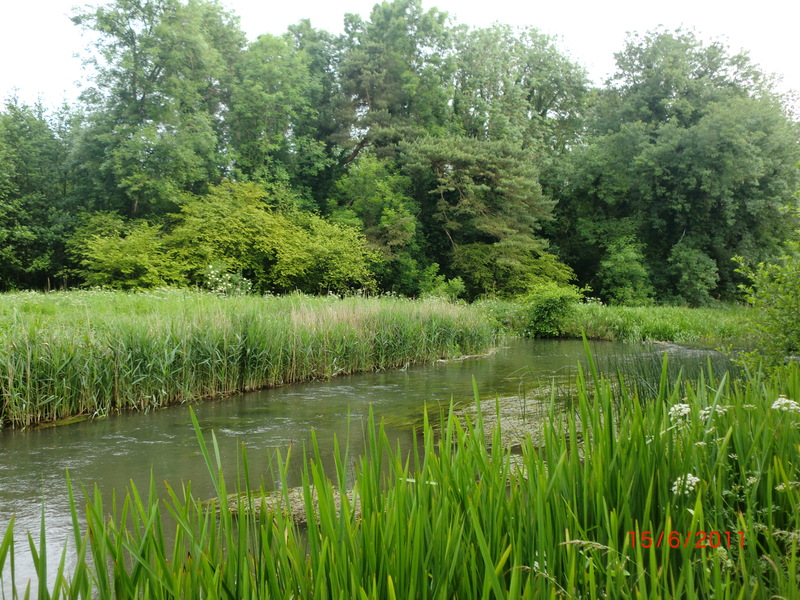 But through its 150 hectares, and just two miles upstream of Newbury, flows the Kennet. and Keeper, Gary Allen explained that above Benham, the River Kennet and the Kennet & Avon Canal are conjoined. 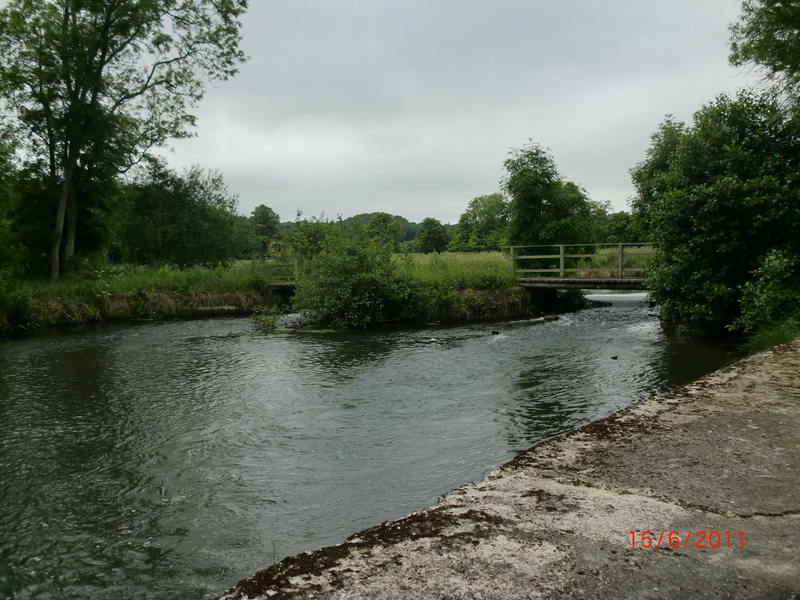 Whereas once the canal ran clear and shoals of fish, mainly roach, were always evident, the onset of lottery funding and the impacts of additional recreational use has changed its character, and water clarity is a distant memory. So this water ‘dirty’ water makes its way into the Kennet. The water I witnessed below the fishing hut has phosphates and suspended solids in it, along with algal growth and greater silt concentration, and low winter rainfall and low Summer levels means that he dare not cut the weed, for fear that whilst flows will increase and some clarity will be regained, water levels will fall and fish stocks will be vulnerable to predation. As a Keeper he is stuck between a ‘rock and a hard place’, and whilst winter rains will restore the aquifers, and improve matters, the real need is a complete separation of the canal and the river, and attempts are ongoing to achieve this. and iron works still show where the diving board stood. I have to confess that I was more impressed by the rises under the trees opposite, but also wary about growing cloud cover and an increasing breeze, suggesting that rain was en route. at the end of the race through the narrow arched brickwork and the etched out deeps, I connected and lost. But another cast and a jerking retrieve (if you have not read Robert Hughes’ ‘A Jerk on One End’…do, it’s very amusing!) and minutes later, my first Kennet brown was banked and returned. 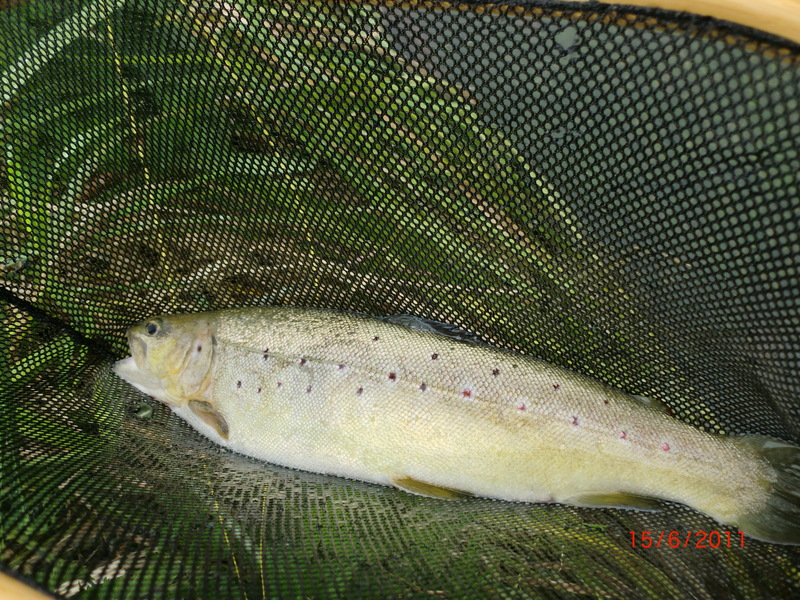 But the rain stopped and we walked and cast occasionally into the carriers, including the renewed, Allens Brook, until a call from Gary suggested we tried emergers on the main stream below the hatch at the top of the club’s beat. Well….a small brown (only my second from the Kennet) was followed by two dace, until a huge shouldered, wide mouthed brown took a look at my Adams, and I was astonished and by its size and just gasped in amazement at what I had seen come up to the surface….and cast eagerly again, for I sensed no contact, and thought that without pricking him, he might be tempted up again….and he was, and was hooked, two casts later. 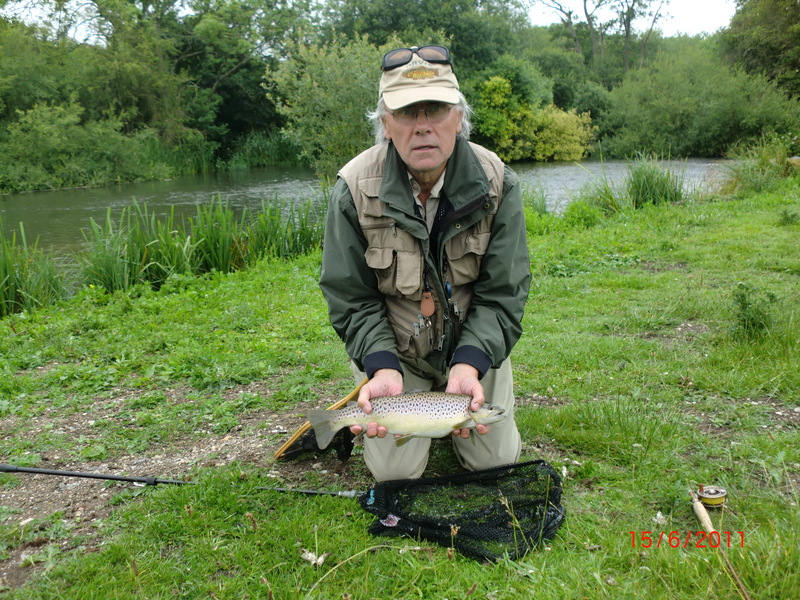 He was strong and fought so hard and I shouted to Howard for help, because from my casting point some feet above the water there was no easy access to net him, and besides mine was too small. because he was a tad under 3lbs, and is yet another large wild brownie which I have been fortunate to catch this season. When you catch such a fish, you stop and think, just what a privilege it is to unhook, hold and admire such beauty, and to know he is going back to grow and enjoy freedom in a lovely stream. And…inside you, the Hunter Gatherer feels that in spite of man’s natural urges, there is no real desire to catch another, for there are few to match him. He was that magnificent, and I am pleased to have returned him. So, stop now, and be grateful…for what you (I) have just experienced. Howard and I hooked up again (sic) and walked the length of the beat to the dreaded A34 bridge, and cast a few times into waters, which may have held fish, but…my day was already complete. Thanks, Howard…now where shall we fish next, together? And on the fly! Oh!….those boards below the bridge on Allens Brook? They mark where Gary has set traps for the horrid American Signal Crayfish, and walking downstream we bumped into him on his 4-wheel, and observed buckets of his ‘catch of the day’, which will by now have been served up and enjoyed by diners in a local pub no doubt. Sadly they will be on the menu for some time to come. 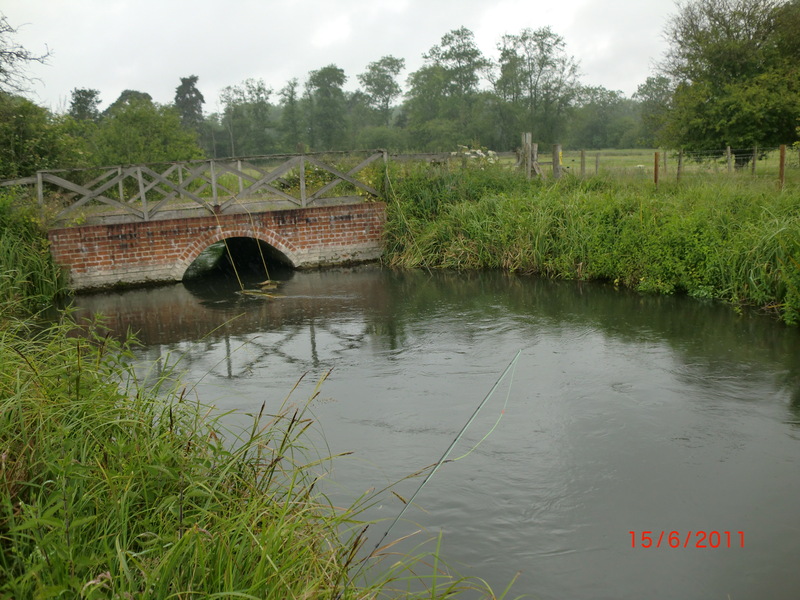 Even though this stretch of the Kennet needs attention, Gary keep(er)s his beat of this special river extremely well. The syndicate is lucky to have him.